With very few days left to Rajasthan Assembly Polls 2018, the list of candidates from who are going to contest was eagerly awaited. Finally, the first list was announced by secretary of Central Election Committee JP Nadda. He made this announcement late on Sunday. It was declared after BJP’s Central Election Committee which was held in New Delhi. The complete declaration has not been made yet. BJP has declared only the first list of candidates. In fact, press release is issued by Bhartiya Janata Party central office. Here’s complete list of candidates in the first list. The list carries the name of 131 candidates out of 200 seats. The first list of BJP candidates featured 85 sitting legislators. In this list, BJP CEC has dropped and shifted few sitting legislators. BJP has given opportunity to 25 new faces. This time, 12 women, 17 SC & 20 ST candidates got tickets. 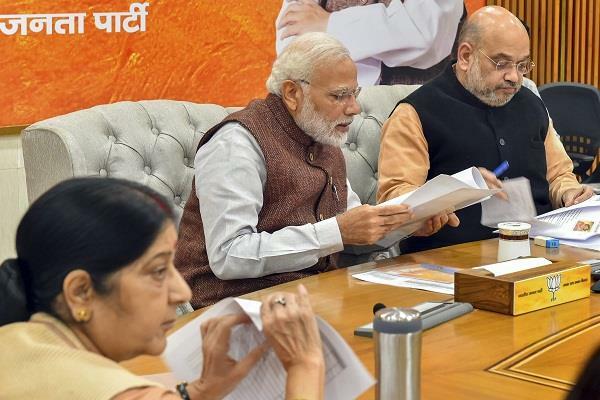 The meeting was held under the leadership of BJP national president Amit Shah in New Delhi which was attended by PM Narendra Modi, Finance Minister Arun Jaitley, Minister of External affair Sushma Swaraj, Rajasthan CM Vasundhara Raje and other top leaders of BJP. As the first list has been announced, names of other nominees will be announced soon.